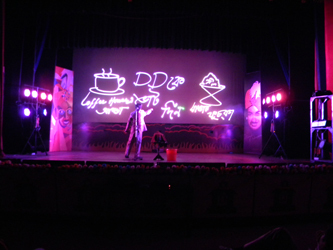 A special version of Manick Sorcar’s world-renowned Laser Light Magic started on the 14th and ran through the 23rd, for a non-stop 10 days with one show per day and two shows on Sundays at Mahajati Sadan, the historic theatre of Government of West Bengal. 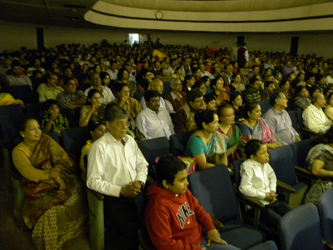 The show was unique in that it was dedicated to two all-time Great Sons of India, Swami Vivekananda and the legendary magician P.C. Sorcar, to celebrate their 150th and 100th birth anniversary respectively. 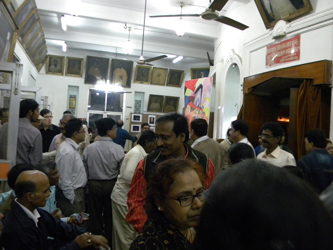 Altogether, it was an extravaganza of solid two hours, filled with history, art, animation, magic and entertainment. 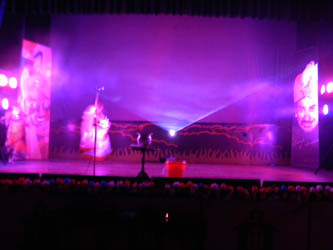 Each day the show started with Vandana, a prayer-dance with laser dedicated to the Holy Trio, leading to “Swamiji” on selected days, the much celebrated one-hour laser documentary on Swami Vivekananda. Regarding dedication to his father P.C. Sorcar, Manick said, “I am here not to talk about the great magician, but rather to share some of the rare moments in the relationship between a father and son. I have been an artist all my life - starting from being a painter, an animator, lighting designer, to being a laserist and applying all of them on stage. 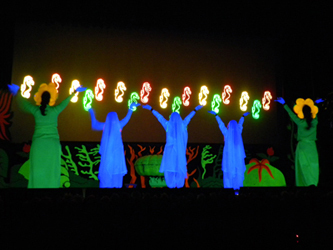 The source of all these go to the back stage of my father’s magic shows, where I did the art work and lighting design. He was the man who kindled my interest in finding art in science, and then mix the two”. Manick then performed some of P.C. 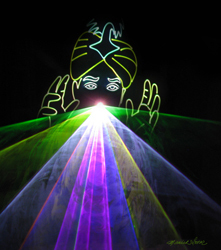 Sorcar’s popular magic items such as the “Birth of Pearl” and “Water of India”, bringing their presentation to the 21st Century with the application of the cutting-edge technology of laser and other type of intelligent lighting – to the great appreciation of the enthusiastic audience. 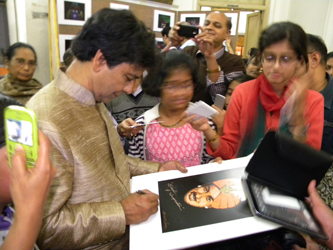 The show also included two popular animation of Manick Sorcar, “The Sage and the Mouse” (Gold Medal, New York International Film Festival) and “Ekushe Aine” (Bronze Plaque, Columbus International Film Festival) to the delight of children at the audience. 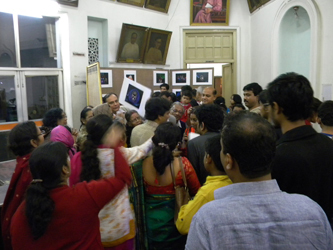 A unique exhibition on P.C. 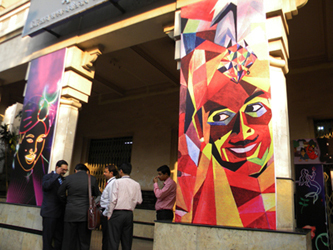 Sorcar was displayed at the lobby, which was filled with the art work of Manick in a variety of media – all dedicated to his father. It included portraits that he had drawn as a teenager to the latest series of laser-art, seed-art, tile-collage, etc. 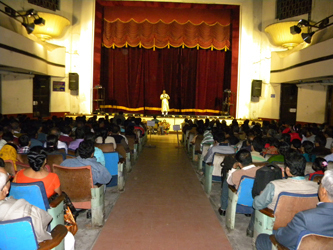 showing P. C. Sorcar at different ages. A great many of the art were immediately purchased by admirers and art-collectors. 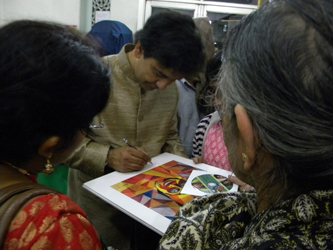 favourites and get them autographed by the artist. Parama Bose: watched your show yesterday evening.fantastic sir!!!!!!!!! Srijan Bhattacharyya: Well, i am one of the Lucky one to be viewing this on 22nd Dec. In fact one of the reasons for my Kol trip is this show! Rajat Dutta: Amader prio Manick babu, mahajati sadan e kaal aapnar darun show dekhechi. Aaro valo legeche, show er sese aamader kaache ese haath melalen, aamar sangeo haath melalen, je haath diye aapni laser anklen. U r a great laser artist. Thank you. Valo thakben r aamader aananda deben. Jackue Bhuyan: I so loved reading the story of you and your relationship with your father, How beautiful that you have honored him in this way.... brought tears to my eyes....such love and gratefulness. Suman Chatterjee: Manickda, The show was one of most enriching experience for me. The show took us back to that era and gave us so much information about Swamiji in such a short time. Thanks you for giving us such a wonderful show.